CAS continually pushes manufacturing techniques forward to produce complex components at high volumes with exceptional quality. CAS manufactures a multitude of precision-engineered components, and castings are often at the core. Yet the casting process is just one in a long chain of high-value services CAS offers. It is the unification of these diverse offerings – into cohesive production programs – that creates real value for our customers. Casting & Manufacturing: Components can be made using cast-in techniques, IFC fabrication, or specialty methods. CAS offers a variety of joining techniques to accommodate different alloys and materials. 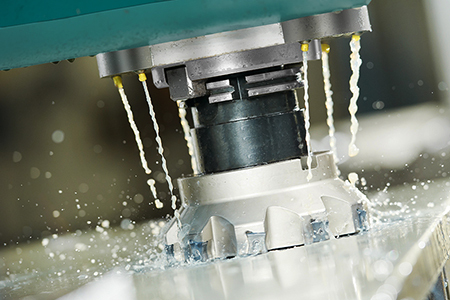 Machining Operations: Machining capabilities include CNC lathes, surface finishers, and multi-axis machine centers (programmable for copy-exact projects and system-linked to dimensional prints). Assembly Services: CAS offers in-house cleanroom assembly & packaging, plus many standard assembly options for electrical, mechanical, and accessory-related components. Surface Finishing: Numerous anodize, plate, and elastomeric coatings are available. Inspection Services: The ensure absolute quality and compliance, CAS utilizes multiple CMM machines, X-ray & ultrasonic imaging, helium leak detectors, digital profilometers, and more. Order Tracking: Customers can track orders online via customer portals on CAS's powerful ERP system. The cast-in construction technique is the heart who we are. With outstanding heat transfer characteristics, extremely uniform part-to-part repeatability, and the ability to accommodate a variety of fitments, cast-in components from CAS deliver the predictable performance required by today’s advanced thermal processes. The cast-in construction approach offers a number of distinct performance and thermal advantages. Heating elements and flow-tubes are precisely located inside the casting; this approach allows for multiple heat zones, optional cooling features, and flow-through functions for liquids or gases to be heated. 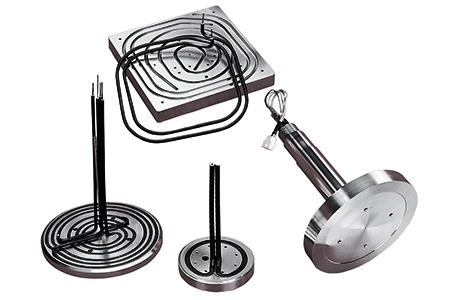 Heating elements have intimate contact with the metal substrate, delivering superior heat transfer, excellent product reliability, and long heater lifespans. There are 2 primary approaches to casting: pressure casting and tilt-pour casting. Both processes utilize a permanent mold, made from hardened tool steel. To optimize mold design and casting processes, CAS utilizes Flow 3-D, a computer-aided manufacturing (CAM) application: this platforms models cavity fill parameters, calculates solidification results, and reduces porosity by preventing air entrapment. 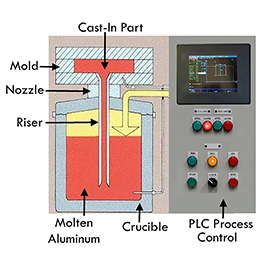 The Pressure Casting approach uses a PLC control system to govern casting parameters. Molds are assigned specific temperature gradients, and directional solidification is carefully controlled. This results in a high-quality casting, with excellent yield, and minimal porosity. With outstanding part-to-part repeatability, this method is perfect for exact copy requirements. With the Tilt-Pour Casting approach, molten aluminum is ladled into a reservoir after it reaches its optimal temperature. 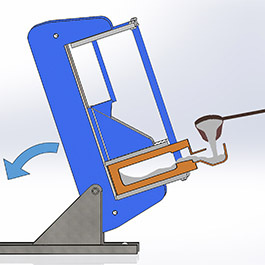 A hydraulic apparatus tilts the mold and reservoir module at a prescribed rate, allowing the aluminum to flow into the mold in a laminar fashion. The gravity-pour approach is appropriate for a range of products, including large high-mass castings. IFC is a high-quality alternative to the cast-in approach. Interference Fit Construction - developed by CAS and offered exclusively by Cast Aluminum Solutions - is an excellent choice when aluminum is not the preferred material choice, or in situations where low tooling costs or quick turnarounds are required. IFC allows for elevated operational temperatures, due to the range of allowable materials. Potential material choices include aluminum, stainless steel, Inconel, nickel, copper; or exotic materials such as Monel, titanium, Hastelloy, molybdenum, Hanes alloys, etc. Permanent mold tooling is not required. Specially–developed groove geometries are precision-machined into the substrate material. 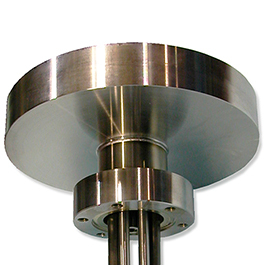 Tubular heaters are then press-fit into the groove using a proprietary CNC insertion process. IFC delivers outstanding heater element reliability due to close contact with metal substrates. Elements can be inserted into a variety of surfaces (planar surfaces, outside diameters of cylinders, multi-faceted or complex geometries). IFC accommodates the ability to insert heater elements as well as flow-tubes (which may carry liquids or gases to be heated or low-temperature fluids that provide a cooling action to the component). Part size is limited only by substrate material dimensions and heater lengths. A key feature of our IFC approach is the pallet of available materials. This small platen has an operating temperature exceeding that of aluminum, so 304 stainless steel was chosen. 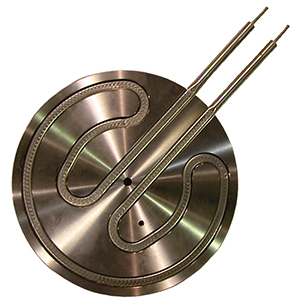 CAS uses a proprietary CNC- assisted fitting technique to ensure heating elements have intimate contact with the grooved metallic substrate. IFC fabrication can be paired with a wide array of weldments, plating & coating options, and machined surface features. Here, a matching under-plate has been vacuum brazed to the primary IFC substrate, creating a unified component. Our casting and IFC processes deliver exceptional baseline components, but quite often the secondary features have the biggest impact on product performance. So CAS offers an expansive choice of machining, assembly and finishing options, to accommodate a diverse range of performance requirements. 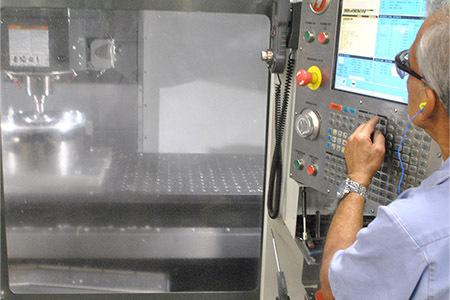 The CAS Manufacturing Center features a variety of multi-axis CNC machining centers, horizontal topping machines, vertical milling machines, and precision surface finishing equipment. 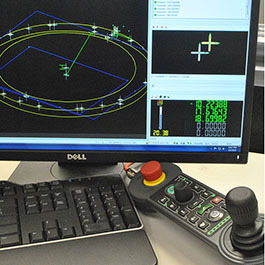 Utilizing the PartMaker CNC programming system, CAD drawings and schematics are efficiently and accurately translated into code for the appropriate machine language. 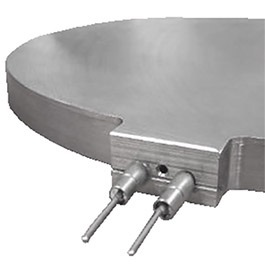 CAS offers multiple joining options - from torch brazing to laser and electron-beam welding - producing stout, leak-proof unions, no matter what material or combination of materials are involved. The Assembly Dept. at CAS offers extensive wiring and testing operations (for heaters, sensors, and electronic accessories), plus installation of terminal housings & electrical enclosures, as well as fasting and test procedures for specialty accessories (such as compression fittings, adapters, unions, etc.). In-house clean room facilities are available for assembly, testing and packaging operations. Medical and semiconductor industry cleanroom specifications are available. The CAS Manufacturing facility features dozens of programmable multi-axis CNC machine centers, many of which feature the very latest technology. 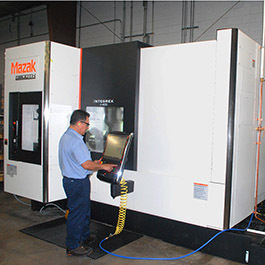 This new Mazak is one of several. Installing the same machine brand throughout the CAS plant has added efficiency to our operations, due to machine language uniformity, interchangeability of tools, and increased operator productivity. 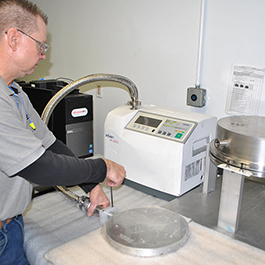 Cast Aluminum Solutions provides numerous product assembly services, component evaluation tasks, and packaging functions in our large on-site cleanroom. Particularly important to our semiconductor and medical device markets, these amenities allow customers to work with a single vendor that meets all their production and certification requirements. Cast Aluminum Solutions offers the following product inspection techniques and verification tools. Dimension and attribute verification tasks are performed in-house at the CAS Laboratory. These appraisals are primarily implemented on volume production programs, but they may also be packaged with prototype projects. 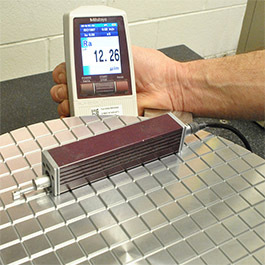 Surface roughness is measured using hands-free profilometers, for verification of roughness average and maximum roughness (micro-inch [μin] and micrometer [μm] measurements). 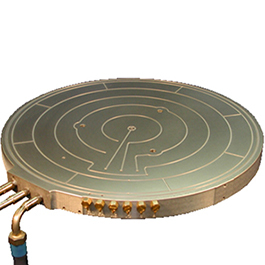 Vacuum integrity of assemblies is tested using highly-sensitive helium leak detectors, with specifications as stringent as 1x10-9 atm-cc / sec. Pressure tests are available to verify the integrity of tubing and pressure vessels. 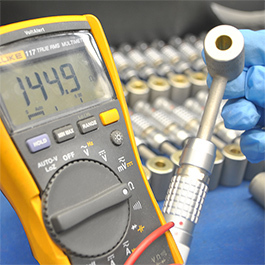 Testing of heating elements and assemblies verifies ohms/resistance, voltage/voltage drop, current, etc. Programmable, automated coordinate measuring machines (CMMs) perform extremely exact dimensional inspections, measuring attribute variations to within a millionth of an inch. Digital CR X-Ray and ultrasonic testing equipment is used to perform non-destructive porosity evaluations and verify the position of heating elements & tubular components. All major product specifications can be recorded, stored and tracked using signed travelers, bar-coded labels, and other part-specific or lot-specific documents. All dimension-critical components are inspected using a CMM (coordinate measuring machine). The CAS Quality Dept. houses several touch-probe bridge-type CMMs, accurate to within a millionth of an inch. These exacting instruments help CAS deliver the level of quantifiable precision our customers demand. Helium leak tests are an important performance appraisal factor on CAS semiconductor vacuum chamber components. CAS Technicians can measure the vacuum integrity of our assemblies to specifications as stringent as 1x10-9 atm-cc / sec. Surface finish is a key performance factor on many CAS products. CAS Quality Technicians use hands-free profilometers to obtain accurate maximum roughness and roughness average figures. Outputted as microinches (μin) or micrometers (μm), these specifications can be documented and stored in part inspection records. Heaters and electronic components are checked several times throughout production to confirm no damage has occurred during the various stages. Ohms testing in the final assembly and test phase verifies heater resistance and ensures full functionality at ship time. 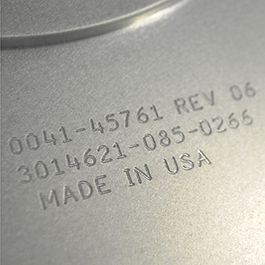 Cast Aluminum Solutions offers a variety of tracking and serialization options. 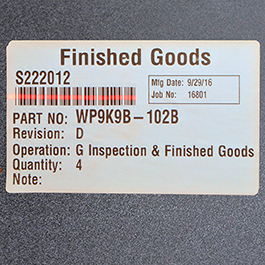 Components may be pin stamped or labeled with part numbers, serial numbers, production dates, certification codes, or other customer-specified data. All CAS-inventoried components are bar coded at initial intake, with notes added for location, date, etc. Coded shipment crates and product boxes (see here) effectively track shipped parts and lots. Manufacture date, job number, part number, and other fields are included on each label. All data points are cross-referenceable using our award-winning ERP (enterprise resource planning) system.